Last week I wrote about a pair of surveys that looked at social media and nonprofits. One came to the conclusion that social media was a waste of time; the other talked about strategic implications on how to be successful. Focus on engagement and relationship building all the time. You don’t have to be doing it at hyper level at the time, but remember relationship building doesn’t have an on and off switch. Story telling is important – as much as can creatively tell a compelling story, the more success you will have. Should be part of a multi-channel effort — they all work together. What’s important is figuring out the right amount of time to invest in particular channels. Focus on the outcomes and keep reporting on the work you are doing. I believe social media will become as ubiquitous to development offices as is the phone, direct mail, and email. In the next decades, we’ll see rapid adoption of social media for many nonprofit purposes, including fundraising and as gen y’s come into their own as donors. Some of the new tools now being launched to create a single profile that can be used across social networks will as analysts predict make social networks like air. We’re still in the early stages of social media as in the early days of the web and online fundraising, so, we are in the “it’s hype, and not going to last” phase. We’re still in transition and the transition will take many years, but I believe fundraising with social media tools will not just be a niche source of income or novelty. So, when nonprofits use the best practices around meaningful engagement they see results. 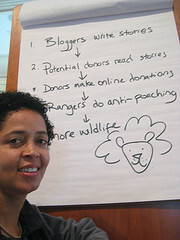 Last month at PopTech, I heard Paula Kahumbu, a PopTech Fellow, talk about her organization’s work and use of social media. Through blogs written about a specific animal by a conservation professional, WildlifeDirect enables individual donors around the world to communicate directly with the people that they are funding. They’ve created a global movement powerful that can respond to any conservation emergency anywhere more swiftly and efficiently than large bureaucratic agencies to reverse the catastrophic loss of habitats and species and secure the future of wildlife in Africa, Asia and around the world. This post originally appeared on Beth’s blog.Beth Kanter is CEO of Zoetica, a consultancy for nonprofits. See her profile, visit her blog, contact Beth or leave a comment.